So my 8 weeks in Tenerife have now sadly come to an end, but at long last I am a PADI divemaster! I could not have done it without great company from my fellow interns along the way, fantastic support from everyone here and of course special thanks must go to all of my Instructors for all their hard work and patience for getting me through my pool skills. The start of the week saw me get signed off on my remaining pool skills and complete my EFR training, and the remainder of the week saw my mum accompany us on 11 dives. On Tuesday we went to Tabaiba where my mum was blown away by the wreck of the El Ratón and the fish life around it, and we also went on only my second night dive of my internship at Abades. This did not disappoint as we saw lots of critters about including a huge angel shark that was completely undisturbed by our presence, as well as some sea hares and a cuttlefish burying itself into the sand. Wednesday saw us attempt to see the rays at Poco but oddly they didn’t show up. On Thursday we went to a rather shallow dive at Las Galletas which none of us had dived before and then did Yellow Mountain for the final time – again no angel sharks this time! On Friday me made another attempt to see the rays at Poco but again they weren’t there, much to my mum’s disappointment. We did however do a lovely dive at El Delphín (another site I had not dived before) and I would definitely do that again on another visit here. Friday night was of course Flo’s (first) final night before returning back to Belgium for 11 days so we marked the occasion by going to Taj’s for my final time and me doing more karaoke down at The Bar. Our day off saw me and my mum along with Flotsam and Jetsam attempt to do the long walk at Masca but unfortunately the water taxis weren’t running so instead we went to Garachico in the north-west and did a windy walk up the cliffs to San Juan del Reparo and back down again. Like the week before it was great to get out of the South and see a different part of the island, which felt a lot more traditionally Spanish. Last but not least, Sunday (and my final) dive was much more relaxed at El Porís. I am sad to leave Tenerife and the Internship but I will keep on checking the website for news and blogs, I hope it won’t be too long before I am back again. 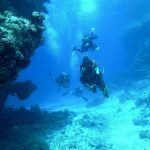 Tagged: Divemaster internship, Diving Holidays, Diving Tenerife, PADI Divemaster internship Tenerife.